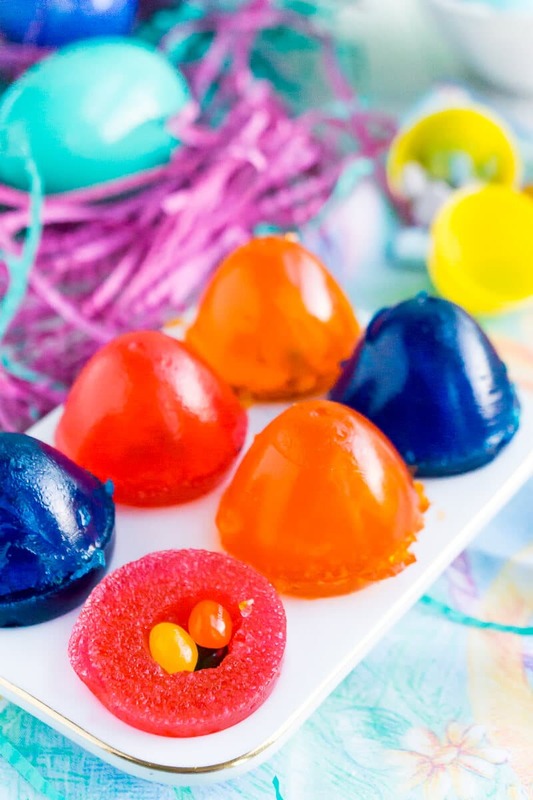 These gummy surprise eggs would make a great addition to any Easter party or any Easter kids table! 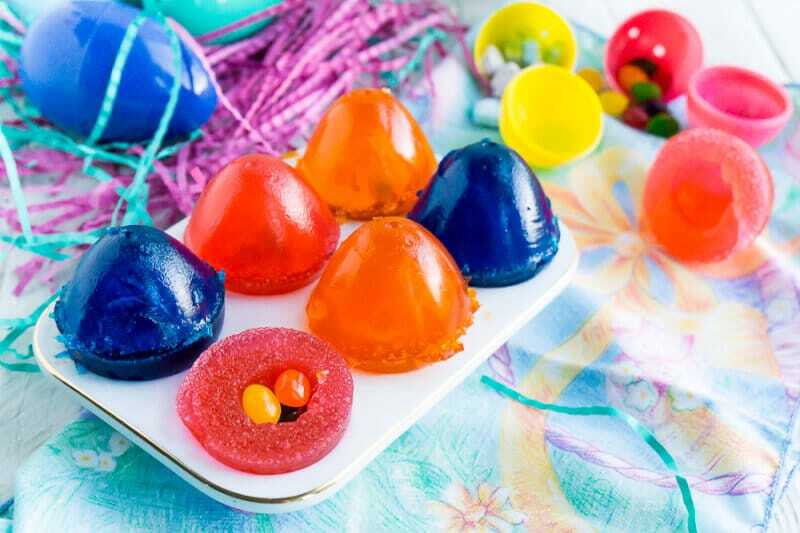 Turn a traditional gelatin dessert into an egg surprise that’s fun for kids and yummy for both kids and adults! My son, like millions of other people around the world, are fascinated by the surprise eggs all over YouTube. Or at least that started on YouTube, now they’re all over the grocery store shelves as well as companies are capitalizing on the fun surprise eggs trend. I kind of hate them, but decided to embrace them for my son’s sake this Easter. 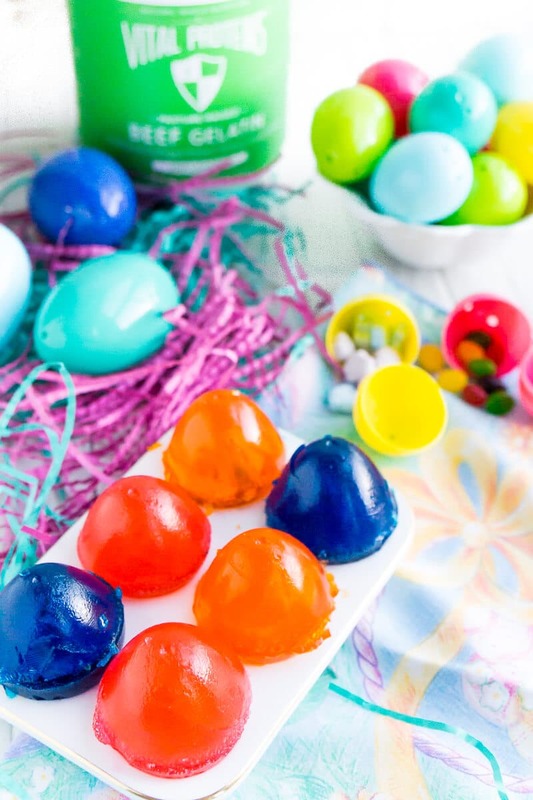 This gummy surprise eggs recipe is so simple yet so fun for kids and yummy for everyone! Even as I was making these, my son came in and had to know what I was doing. He saw the eggs and immediately decided he needed to play with the gummy eggs to see what was inside. We might’ve had Easter candy for dinner instead of actual food, but hey, he loved them. And that’s all that matters right? 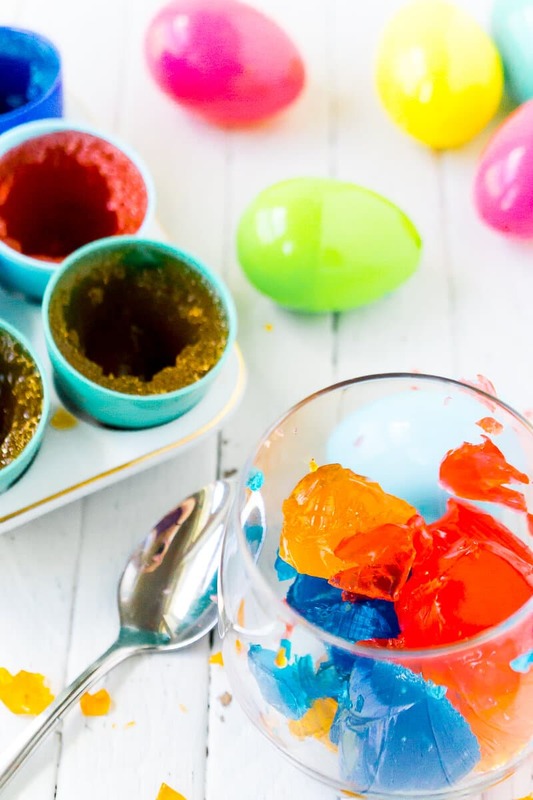 All you need to make the gummy surprise eggs is some plastic eggs, lemonade, food coloring, sugar, and Vital Proteins Beef Gelatin. The stuff is amazing because you can really put it in anything and add a nice boost of protein without changing the flavor or color. And with these eggs, the color is super important because if your colors don’t match, the eggs won’t look like they go together. The Vital Proteins gelatin sets fairly quickly as well and gives you that great gummy texture without adding any weird flavor. All you do to make these eggs is mix a little lemonade with food coloring, gelatin, and sugar. Add that mixture to plastic eggs and refrigerate. 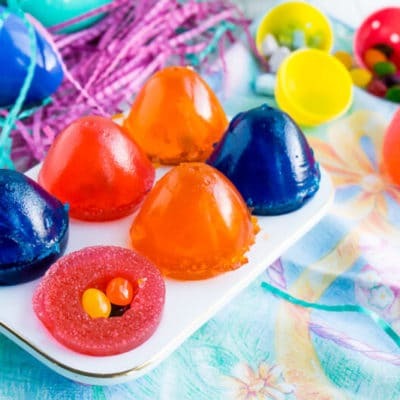 Remove from the plastic eggs, fill with treats, and you have delicious gummy surprise eggs. Sounds easy right? It is, but it’s only easy if you read and follow the detailed instructions in the printable recipe. There are three keys to getting these gummy surprise eggs right. I’ve included them in the printable recipe but wanted to mention them here as well because they can make or break your eggs, literally. First, you have to grease the inside of the plastic eggs before you put the gelatin mixture in. If you don’t, the eggs won’t slide out and like I said, you’ll literally break them. Learned that the hard way on my first try. You could always try cutting the eggs off if you forget but that’s easier said than done. And a waste of Easter eggs. Second, you need to color all of the lemonade at one time of a particular color at once. Then split it up into lemonade to heat, lemonade for the top, lemonade for the bottom shell, etc. If you split it first then try to color it, you’ll end up with different shades of the same color. And unless you’re going for color-blocked eggs, it’s going to look weird. And finally, make sure to add the hot lemonade right away after adding the gelatin to the cold lemonade mixture. Adding it right away will help you avoid any clumps of gelatin. If you do get clumps, just use a spoon to gently remove the clumps from the mixture before (or after) pouring into the egg, before you put it in the fridge. 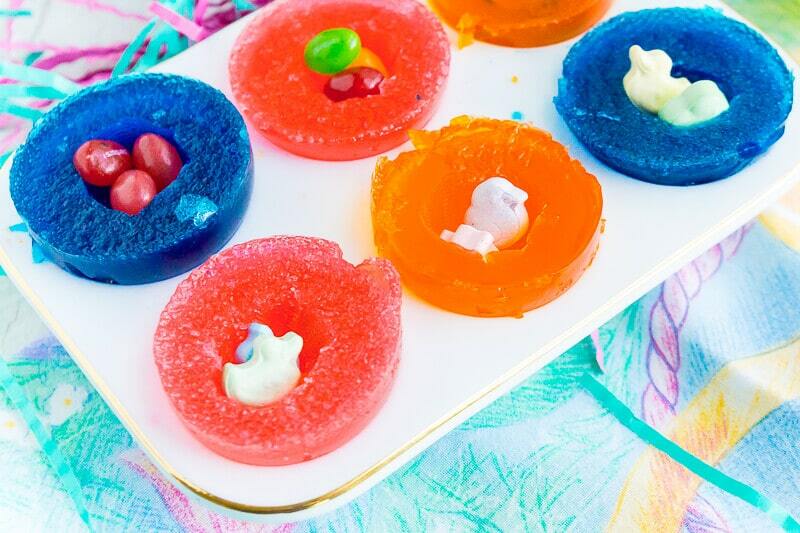 Serve these gummy surprise eggs alongside these rainbow donuts, these strawberry salad shooters, and this pineapple monkey bread for the perfect Easter dessert spread! 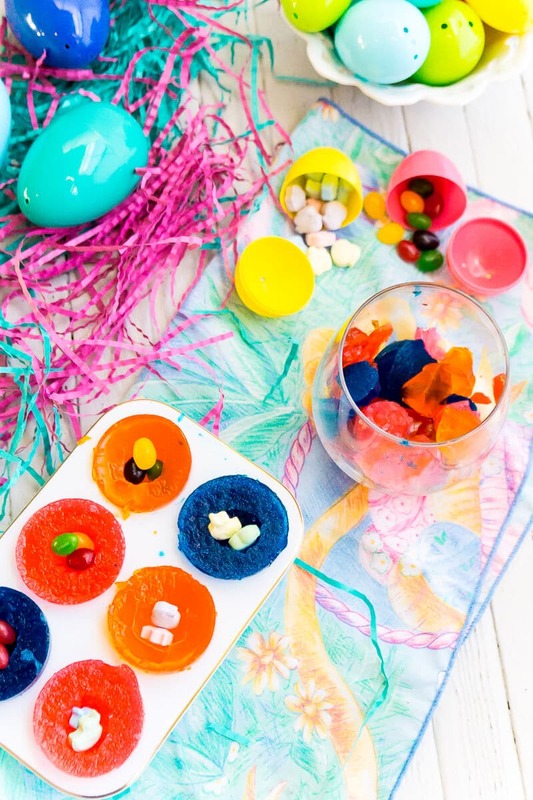 These DIY gummy surprise eggs are one of the most fun Easter egg ideas ever! They're yummy and hide a secret Easter surprise inside the edible Easter eggs! Throughly wash six of the extra large plastic eggs. If the eggs have holes in them, use tape to seal the holes completely from the outside. You could also use regular size eggs, you just won't be able to fit as much candy inside. Use a non-stick baking spray or coconut oil to lightly grease the inside of the eggs. Don't skip this step or the gummy eggs will break when you're trying to get them out. Divide lemonade into three containers. You want 2/3 cup + 1/2 cup in each of the containers. Add sugar and food coloring to lemonade to create desired colors. For darker colors, you only need 1-2 drops and for lighter colors, you'll want 3-4 drops. Mix thoroughly until well combined. Split each container of lemonade into two containers, making sure one container is microwave safe. You'll have two containers of each color lemonade - one to heat and one to remain at room temperature or cold. Microwave one container of each color of lemonade for one minute or until hot. Remove from the microwave. 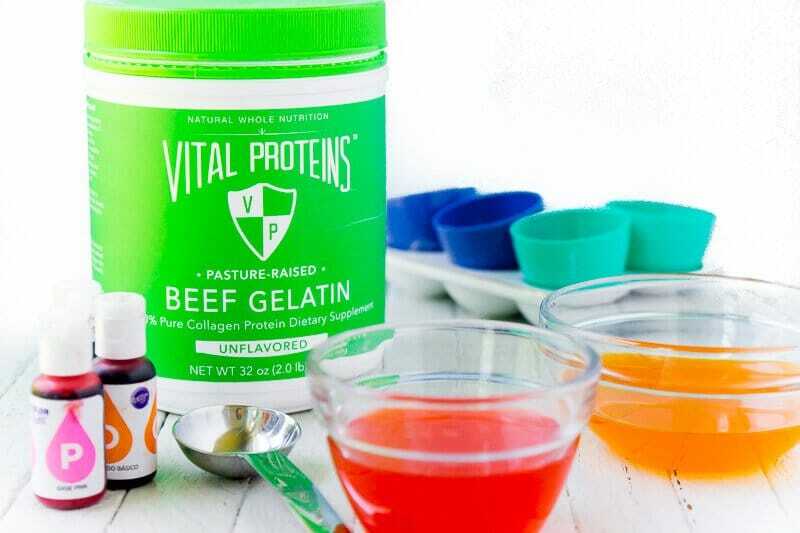 Mix 1 TBS of Vital Proteins beef gelatin into the cold lemonade then immediately mix in the hot lemonade of the same color, mixing until the gelatin is completely dissolved into the liquid. Pour colored lemonade into two of the prepared plastic egg shells, filling the top and bottom of each egg. Repeat the same process with the other two lemonade colors so you end up with six (twelve total halves) fill plastic eggs. 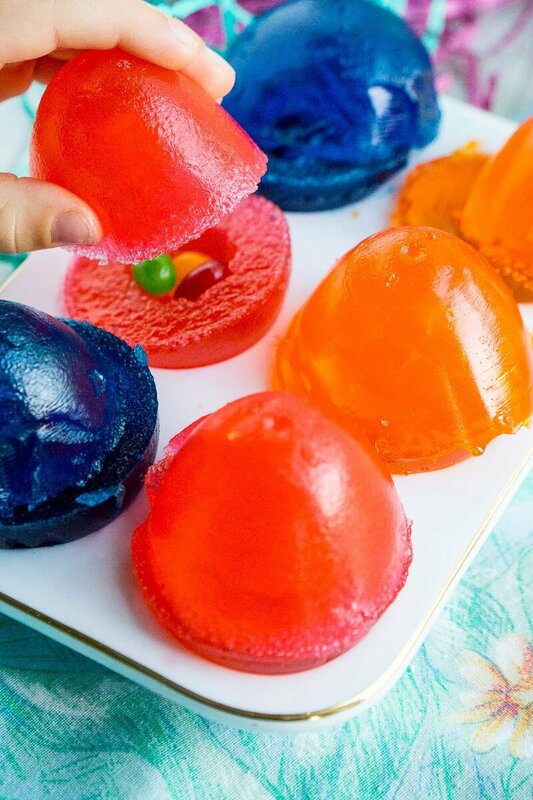 Place in refrigerator and set until the gummy mixture is completely set, I recommend an hour. Remove the eggs from the refrigerator and use a knife or spoon to take out a small scoop from each egg. You don't want the scoop to be too big or the egg shell with collapse on itself once removed from the plastic egg. Gently use a butter knife to loosen the gummy eggs from the plastic eggs, like if you were getting a muffin out of a muffin tin. Pat the plastic egg gently until the gelatin egg half comes out. Place the bottom of the egg in an egg holder, fill with a few pieces of Easter candy, then top with the matching eggshell half. Repeat with all of the eggs. Keep eggs refrigerated until you are planning to serve them.